Miami Trace’s Aubrey Schwartz (left) and Hanna Reisinger (at right) teamed up to apply defensive pressure to a Wilmington player during an SCOL match at Miami Trace High School Thursday, Sept. 22, 2016. The Wilmington Lady Hurricane soccer team visited Miami Trace High School for what was likely the final time Thursday evening. The league is disbanding after this school year and Wilmington, along with Clinton-Massie and East Clinton, will be joining the Southern Buckeye Conference. Miami Trace, along with Washington, Hillsboro, McClain and Chillicothe will form a new league with Jackson starting in August of 2017. Thursday, Wilmington won the match, 4-1. Wilmington scored in the first half with 34:30 and 1:55 to play, respectively. Becca Ratliff scored for Miami Trace with 11.1 seconds to play in the first half. Wilmington held a 2-1 halftime lead. Wilmington scored at the 27:39 and 11:30 marks of the second half. Taylor Barrett had 12 saves for Miami Trace. The Lady Panthers had 13 shots. “In the first half, our girls played well,” Miami Trace head coach Caitlin Francis said. “In the second half, we left some marks on defense and they snuck some goals in. “In the final 10 minutes, we stepped up our play, we just didn’t get the shots to fall,” Francis said. 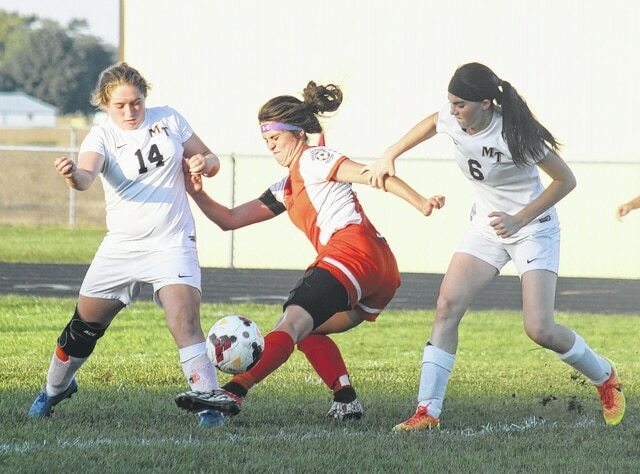 Miami Trace (now 2-9 overall, 2-6 in the SCOL) will host McClain Tuesday at 5 p.m.
https://www.recordherald.com/wp-content/uploads/sites/27/2016/09/web1_MT-girls-soccer-vs-Wiilmington-9-22-2016.jpgMiami Trace’s Aubrey Schwartz (left) and Hanna Reisinger (at right) teamed up to apply defensive pressure to a Wilmington player during an SCOL match at Miami Trace High School Thursday, Sept. 22, 2016.